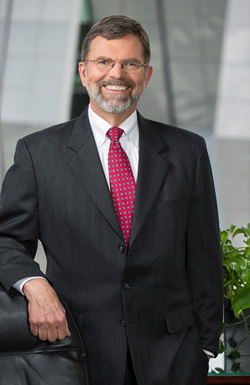 Kent Calfee has extensive experience in representing clients in real estate matters including purchase and sale, leasing, financing, real property tax, and land use matters. Kent has handled complex transactions involving §1031 exchanges, loan restructuring, family business planning and reorganization, and large agricultural operations. Kent has a strong background in areas of agricultural law, and has represented landlords and tenants, including orchard development transactions, growers, processers, and marketers. Kent also has experience in counseling business clients, including successful family businesses, in the formation of business entities, purchase and sale agreements, reorganization and dissolutions of business entities, and general operational business counselling. Kent is an AV® Peer Review Rated attorney, the highest rating given by Martindale-Hubbell for legal ability and ethical standards.